Persépolis-Relieve-Irán - Iran: Relieves de la Sala de las Cien Columnas, utilizada para recepciones. Los relieves de la puerta norte muestran a oficiales militares. 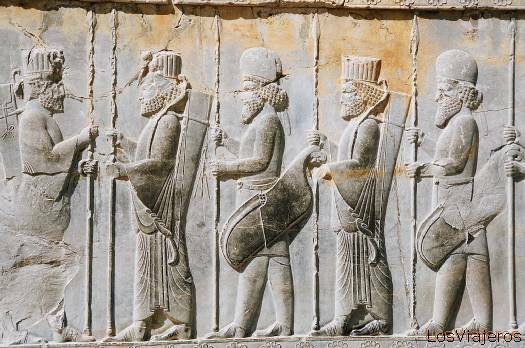 Persepolis-Relief-Iran: Reliefs in the One Hundred Columns Hall, used for receptions. The reliefs on the northen doorjambs depict military officials. Photos of Iran: Pictures of Iran: Tehran, Persepolis, Shiraz, Isfahan, Kashan, Kandovan, Kurdistan.